One bag with two gigantic uses. 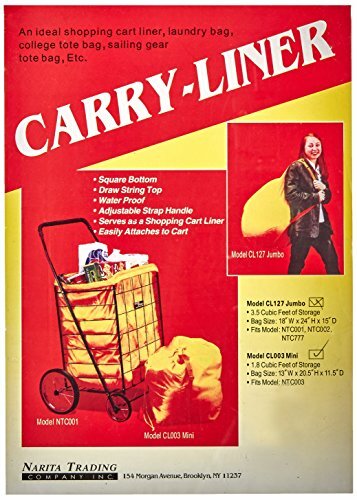 It can be used as a carrying tote or a liner for our shopping carts. This bag has a square bottom which increases its capacity and fits our mini shopping carts like a glove. With capacity of 1-1/2 cubic feet, it is big enough for any job such as laundry or shopping. Made with water repellent nylon, it is both practical and multipurpose. An adjustable shoulder strap makes it easy to carry. This bag has velcro fasteners built-in which makes it a breeze to attach to our carts or any shopping carts.